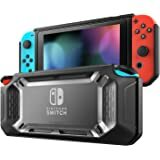 Maintain some serious damage control when you outfit your Nintendo Switch with this Heavy Duty Rugged Case by Mumba! 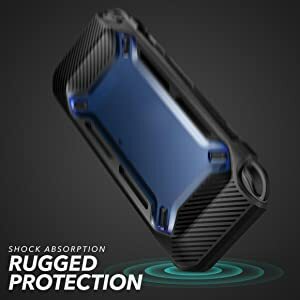 This case is constructed of a hybrid combination of soft, shock-absorbent TPU and hard, damage-resistant Polycarbonate to protect against drops, falls, scratches and more. 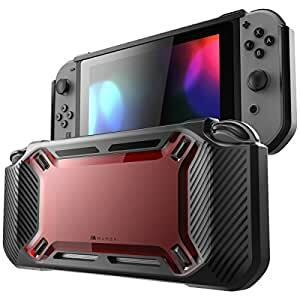 You can also expect an enhanced textured grip and responsive button covers, so start gaming and stop worrying - try this case out today! Mumba products are designed to keep all of your favorite devices as safe as possible. We study each device to ensure we make products that will provide an elevated and customized level of protection. We want you to worry about getting the most out of your gadget – let us worry about its safety. 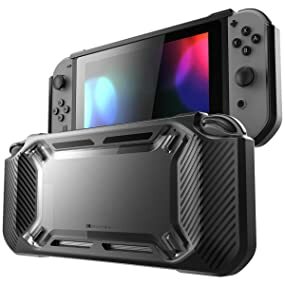 Our Heavy Duty Rugged Case is the perfect accessory for your Nintendo Switch. 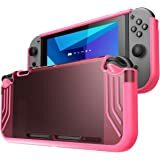 With helpful features such as an ergonomically designed handle, scratch-resistant frost-clear back panel, shock-absorbent bumper and even rubber detailing that stops your Switch from sliding across the table and falling on the floor. A bumper made of TPU materials ensures that shock caused by drops and falls is absorbed away from your Switch. 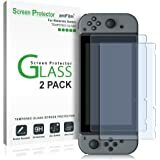 A frost-clear backing provides a scratch-resistant barrier for your device. This case is designed to fit comfortably in your hand for hours of safe fun. The TPU strips on the handle even help to make a secure, non-slip grip. Silicone detailing on the back ensure that your switch stays put when you place it down on surfaces. 5.0 out of 5 starsGreat case! 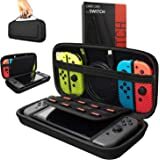 This product was a perfect fit on the nintendo switch. 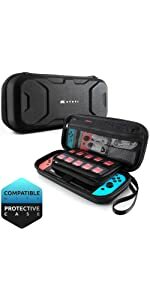 I feel more safe travelling with the switch whilst using this case. 5.0 out of 5 starsAn Absolute Must Have! 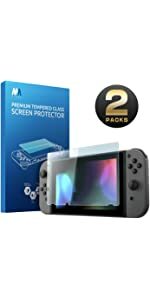 This is the best accessory I've purchased for the Switch. Bar none. It makes it easier to hold. It's much more comfortable. 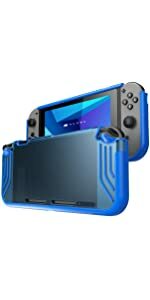 The Switch is also better looking in the case. I don't know what's wrong with some of the other reviewers, but this case is a cinch to put on and take off. It couldn't be easier. It's also very easy to change game cards with the case on. Clearly some reviewers don't know how to open the game card door all the way. Don't listen to these reviews. They're simply wrong. As for charging in the dock, of course you can't do it with this case on. That's just common sense. The dock was designed to hold the Switch console as is. That's just a ridiculous gripe. You can still charge it in the case using the A/C adapter. Someone even complained about the inability to attach a wrist strap and the danger of dropping it. First, if you can't hold onto something without it being attached to you, that's not the manufacturer's fault. Second, and more importantly, there IS a place to attach a lanyard or wrist strap. It's on the bottom right corner. Another invalid complaint. I'm the type of person who complains and finds something wrong with everything, but I couldn't be happier with this purchase. 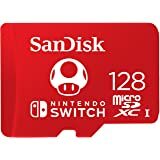 There are countless things I'm disappointed about with the Switch, and the discomfort was a big one. 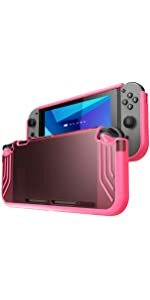 Nintendo should be thanking this company, because just the addition of this grip made me have a MUCH more positive outlook toward the Switch. If you have any issues with comfort, while playing in console mode, get this grip. It will be the best money you ever spent. If I had to change one thing, since I can never be completely happy, it would be the clear back. While I understand it was designed for aesthetics, the slick plastic is different than the rest of the material and you can feel it while your holding it. Slightly. Maybe all that's needed is to make it a little smaller, so your fingers don't touch it. This is such a trivial thing, I shouldn't even mention it, but like I said earlier, I have to find something to complain about. While we're on the subject of material, maybe I'd make it a little more grippy. It's a tad slick. Just slightly. OK, so 2 things, but neither affects my love of this accessory. Buy this case. You will not be disappointed. 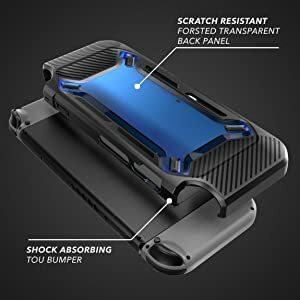 5.0 out of 5 starsIf you want serious protection, buy this case! 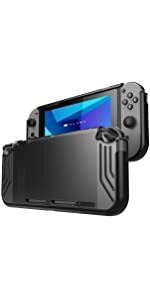 This is the best case for the Switch. The rubber/plastic mix makes it feel very sturdy and wonderful to hold. It is easy to install and take off. 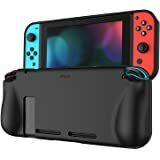 Some people have complained that when the case is on the Joy Cons can not be removed and the Switch can not fit in the dock. If this is a deal breaker for you look elsewhere but from the description and pictures it is pretty easy to understand this before buying. 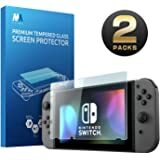 With this case on my Switch along with a tempered glass screen protector I feel like my device is as protected as possible. The only minor flaw is that it is slightly harder to put game cards in the slot when the case is attached. However, it is by no means a serious problem and I still think this case is worthy of a perfect 5 stars. I don't only like that it looks great, but the grip adds a nice feeling and touch. The only con for me is that if you are someone who constantly detach the joy-cons to play, you will need to take the cover off. For someone like me who leave them attached and use pro controller, there's no problem at all. It protects it very well. Note that you'll need the extender cable for the stand because it won't fit in it either unless you take of the cover. 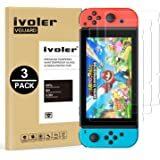 The extender cable is a must even if you do not buy a cover because there have been reports of scratches on the screen while docking and un-docking the switch. 5.0 out of 5 starsWife and I love it! The protective case feels solid. It’s not the type of plastic that if it’s dropped, it’ll break instantly but it’s also not the type of rubber that will fall off from the device by itself and not protect it at all. It’s right in between. 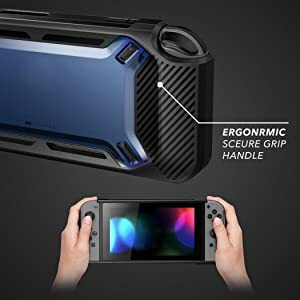 It also give you a better grip on the switch. It feels really good. More confortable than holding the switch naked. I bought the neon green one since it was he only color available at the time (the rest were out of stock) and let me telll you that I love this color on it. My joy-cons are neon color as well so for me it’s perfect. I’m a 25 year old dude and this thing makes me feel young again lol. My wife makes fun of me because I act like a little kid again while playing on it and when I stare at the device because of how good it looks. My most recent Nintendo console was the Super Nintendo in the 90’s. This is a big jump here lol. Here are some pictures.